Treat your tap water, and provide a safe environment for freshwater fish instantly and easily with API STRESS COAT Freshwater Aquarium Water Conditioner. Tap water contains chlorine, chloramines and ammonia which can cause gill and tissue damage, breathing difficulty, stress and death. API STRESS COAT Aquarium Water Conditioner works instantly as a water conditioner to remove chlorine and chloramines from tap water and neutralize heavy metals. API STRESS COAT Freshwater Aquarium Water Conditioner Treatment contains aloe vera, and it is scientifically proven to reduce fish stress by 40% and heal damaged fish tissue. This conditioner replaces the natural secretion of slime that is interrupted by handling, shipping, fish fighting, or other forms of stress and helps heal torn fins and skin wounds while promoting tissue regeneration. 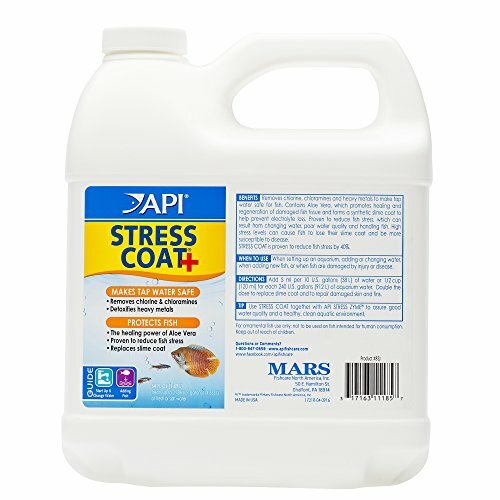 API STRESS COAT is recommended by professional fish handlers. With API Aquarium products, it’s easy to keep a beautiful saltwater, freshwater or reef aquarium. For over 50 years, API has been creating innovative, research-driven solutions that make it easier to care for your fish and aquarium. API Aquarium Treatment Supplies are designed to work in conjunction with each other to provide best results to control algae, promote healthy bacterial growth and help control and cure fish diseases and conditions such as ich and fin rot. They work to provide a safe, hospitable environment for fish such as tropical community fish, cichlids, goldfish and more. With API, you can spend more time admiring your fish, and less time scrubbing your tank. Make sure to use all products as directed in order to ensure the best results. Color: API Stress Coat Freshwater Aquarium Water Conditioner, 64 fl. oz.